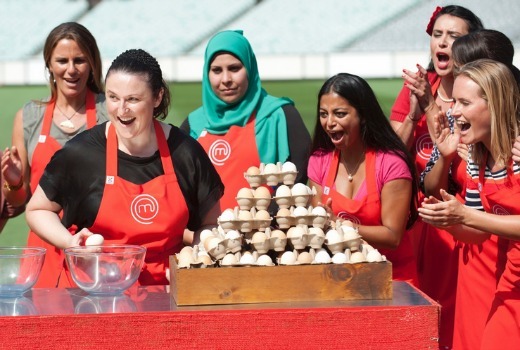 By now everybody who knows MasterChef Australia is back knows the show will open with a Boys v Girls challenge. The promo has attracted a wave of comment, some of it critical and some of it questioning a ‘sexist’ approach to the show. It’s since emerged that Boys v Girls is one of the show’s themed weeks. Others to roll out across the series include Italian Week, Kids Week, Middle Eastern Week, Barossa Week, and WA Week. As Gary Mehigan explains, the promo was intended to demonstrate a lighter tone to the series this year. “The press grabbed hold of five or six people who were pretty strong in terms of how they came across in the Boys v Girls ad. But it’s strange, we never thought about it like that. We’ve always felt Masterchef’s popularity has been because we’re not stereotypical and that we blow stereotypes out of the water. The reason we’re very popular in India, Malaysia, Venezuala, Mexico, France is because people get to see Australians for who they are,” he says. One of the tweets he responded to, accused the show of dragging us back to 1975. This is the 5th season of MasterChef and the 10th incarnation of the brand and it includes a Masterclass with a studio audience. This year there’s also a push towards food that can be replicated at home. “We’ve made a promise, particularly amongst the three judges, that there has to be a take-home component. Series 4 was an absolute stand-out in terms of the contestants. We still say they were probably the best cooks we’ve ever had on the competition. But they were almost too good,” he says. “A lot of the feedback we get on the street is ‘Wow I don’t think I could ever do that!’ So that’s stuck in our heads. Unlike previous years the show skips its Top 50 and opens with its 22 finalists. There have been other subtle differences to freshen up the show, but apparently not at the risk of ditching a few favourites. “We’ve changed the language a little bit. Rather than ‘Mystery Box’ we’ve made it about ‘What’s in your fridge? What are you going to cook for the weekend? What’s in your larder?’ to make it as relatable as possible,” Mehigan explains. “I don’t want to be using the same terminology for 5 years or so, it needs to change. “MasterChef still has a core audience who love the show and don’t want to see it change but we’ve just kind of nudged it a little bit. Shooting of the fifth season, now based in Melbourne, is currently half-completed. Contestants are housed in an undisclosed house in a “leafy Melbourne suburb”. There are several interstate trips and a secret overseas destination. “Fingers crossed. If all goes to plan in our television world!” he teased. With TEN having plenty of ratings challenges this year, and following from the huge numbers of My Kitchen Rules, MasterChef sure has a lot on its plate. But Mehigan holds fast to the show’s authenticity. “The challenge has got to be fair. We judge the food only, it’s not driven by cast or personality, or just because we like someone. In the end we hold true to the fact that the best dish wins on the day. “If you’re in an elimination challenge and you cook the worst dish then you’re going home. I always relate that to a restaurant. If I cook a bad dish or my staff serve a customer badly then it’s unlikely the customer comes back. “We’re not heavily-scripted. We have a plan, we have a bullet-point that we follow but there’s always a trail of our own thoughts and our own feelings. I can say what I want to say and I think that comes across quite clearly. “At the end when we have to make that decision our executive producer will ask us, ‘Who’s food was the best food?’ It’s really nice to hear that because our producer doesn’t want someone to stay because they’re controversial. MasterChef returns 7:30pm Sunday on TEN. I’m glad they stopped the top 50 as well. Saw an ad where they are saying some dish is the worse thing they have ever eaten, so wondering what that is. I thought it was the camel livers from the Professionals. Well I didn’t know there were any boys or girls in the show! I can only see women and men. The promo is cheap, shocking colours, and not what I expected to be the first major promo. Updated promo that aired during Offspring last night “I’m a 1950’s housewife with a lesbian twist”. So they are starting to reveal the “who they really are” in advance. I like the ads they make me laugh. I don’t take it seriously. Looking forward to WA week. Reading the quotes, Gary talks almost exactly like the network executives in The Simpsons. I can’t take anything he says seriously or believe him in any way. I wonder if George and Matt would agree with Gary’s comments about the show being all about the food? I turned off because it seemed like they thought the show was all about them. I think skipping the top 50 is a good move, the girls = pink and boys = blue stereotype was not a good move. Looking forward to the show starting though.